Boredom Breaker Naturals Willow Treat Basket provides small furry animals with a little piece of nibbley heaven. This delightful collection of goodies includes a delicious corn on the cob along with other sumptuous treats for your pet to sink their teeth into. Offering a different snack each day, this treat basket provides vital mental stimulation and is a great complement to a well-balanced diet. 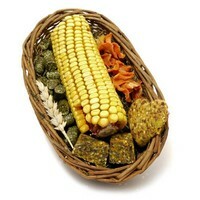 Cereals, vegetables, vegetable by-products, meadow hay, seeds, fruits, nuts, egg and egg products. Pleases my guinea pigs and they loved tearing up the wicker basket. Good value and great stimulation.